You are sneaky...almost just as much as the other crazy running around on this site. Yes, the existence of something cute. So I heard you saw what me and someone else did together. Why is Zoroark a Pikachu? small foxes are crazier than larger foxes...I think. Why would you want to use that? what on earth could possibly help your craziness? Would you be his godmother if a certain event happens? What do you plan to so with Cat's craziness? I think Cat's craziness may have rubbed off on you. Yes, very good. By the way, Solosis asked the other day if you were his mom. Hold on... you stole Cat's Pokéwalkers? ...Wait, you're a Zoroark, you're supposed to do that. Carry on then. That pair is crazy. Needs 1 more fox though, then it'll be complete. Ya think I couldn't tell that already? Haven't seen you in a while! I missed your beautiful hair. Maybe, or I just covered my own eyes with your hair. I want to spam Zorua. ..so this thing still exists, huh? 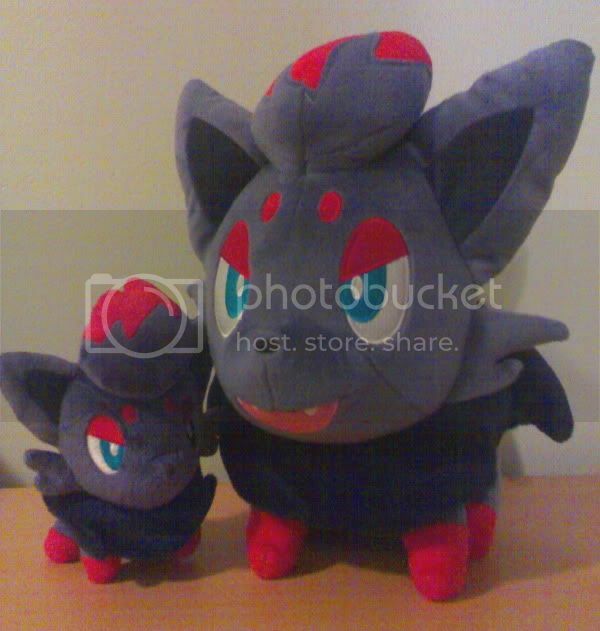 You haven't met my pet Zoroark before, have you?